Hi all. A bit of introduction first. I’ve been a hobby woodworker for about 30 years. I build a lot of furniture and gifts, and the occasional set of kitchen cabinets for side work. I’m also an avid hunter and fisherman. About 10 years ago, I decided I was tired of paddling a couple of miles each way to get to my duck hunting spot, and I wanted a new project, so I started looking at building a boat. That of course led me here, and to the Duck Boat Two. So what happened? 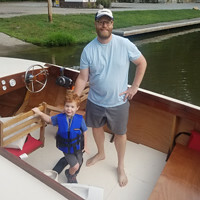 Well, I’m horrible at documenting things, but I built the boat over the next 6 months, and have been happily using it ever since. I recently started thinking about building another boat, and in looking at the forum (and builder pictures), I realized I never sent in any pictures of mine. Given the lack of builds of this model, I figured I’d start this post and catch up before asking a whole new set of questions about my next build. Duck Boat Two complete, looking for a new project! So after clearing out a space in the shop and reading the plans and instructions about 20 times, I felt I was ready to start. The DB2 does not have a building frame, but I wanted to raise it off the floor a bit to make it easier on my back. My platform was simply OSB laid on 2x6’s, laid on milk crates I’ve had around for years. This proved to be a comfortable height to work off, and was plenty stable throughout the build. Frames were built up from clear pine, and transom was cut from ¾ marine ply. Lastly the stem was cut from a 2x8 clear chunk of spruce. This portion went together pretty quick, with only minor issues. First, I notched the transom for the sheer clamp when I shouldn’t have. I also wasn’t happy with how the chine came into the stem, and ended up building that out a bit more, then fairing back. Next came the bottom and sides out of ¼ marine. Lots of filling and sanding, then three coats of epoxy to seal everything. At this point I was feeling pretty good, even though I basically had a boat shaped flat table in my shop. A few days later, I enlisted the spousal unit to help flip it over. I can’t believe how light it was at this point, yet very strong and stiff. Flipped over – now it started looking like a boat! At this point, I went all in on the decking, interior, seats, and finishing hardware. So much so I didn’t take any pictures! Once everything was encapsulated, I painted the entire thing in white Marine Rustoleum primer, then brown Rustoleum on the bottom, and Herter’s Dead Grass on the sides and top. Also somewhere in here, I changed my mind on hauling it in the back of the truck and decided to build a trailer. I started with a Harbor Freight 4x8 trailer. I heavily modified this trailer, including longer tongue, fully welded joints, added bunks, winch, etc. Here’s a picture of the trailer freshly painted, then the first time the boat was on the trailer. Now the boat was usable, but my wife says to me – why didn’t you paint it? I of course say I did paint it, painstakingly! She (the artist) says, no, it’s ugly. It’s supposed to be ugly, it’s a duck boat! So at her request, I looked into an purchased a stencil kit to camo it similar to where I hunt. She actually did most of the stenciling, and I think it came out great! These pictures are from the maiden voyage. The motor is a Merc 39 4 hp that I picked up in excellent condition. I used it like this for the next three seasons. Unfortunately, where I hunt gets very shallow, and I ended up plugging the motor intake every year. On the third year, I did a full rebuild on the motor, and started thinking about building a mud motor. I chose a long tail design, and started mocking parts up using a Predator 6.5 hp motor. Here’s a few shots of the beginning of this build. That’s how it has been for the past 5 years. I use the boat a couple times each spring, and maybe 6-8 times in the fall, and it works perfectly for my use. If you made it this far, thanks for following along. I'll close it with a couple of my favorite shots. Moderators, if these are not allowed, let me know and I'll gladly delete these final photos. That's awesome! Thanks for sharing. What are your ideas for the next boat? That's Bailey! She was always proud, tired, and filthy after a hunt! She passed 3 years ago at 14 years old. Truly mans best friend. One more of my gratuitous boating dog picture. hoodman wrote: That's awesome! Thanks for sharing. What are your ideas for the next boat? I haven't totally decided, but I'm leaning heavily toward a Monaco utility version. I love the looks, still need to do some more research and pricing considerations.